It's strange that a doper comedian like myself is writing about fitness. Most people think that dopers and good health don’t’ go together. It’s like expecting neo-Nazis to drink lite beer during Oktoberfest. But I figure if Howard Stern can write a best-seller, I can write about something I've been doing for the past thirty-five years without going blind. That’s right, folks. Since I was sixteen years old, I’ve been pumping iron, and still found time to work out with dope, booze, and women. If you intellectuals think that a dope is the kid who flunked third grade six times, you’re not so intellectual. A doper is someone whose addiction to illegal substances has prevented him or her from keeping fit. Not me. The trick is to think backwards. I didn’t let keeping fit prevent me from keeping from becoming addicted to illegal substances. I have developed a philosophy of living that I call DF, short for Debauched Fitness. I’m living proof that there’s no inherent contradiction in staying in shape and going to pot, only a mild schizophrenia which can be controlled with a prescription drug from the night doctor. Even the hippest people have some kind of fitness routine. The key is circulation; the body’s digestive tract is like a sewer system. If you don’t exercise, you get blocked up, and if you get blocked up, you can’t snort or inhale without risking severe trouser damage. Next time you need cash to make a buy, don’t drive to your ATM machine -- run. While you’re there you’ll probably meet some low life who’ll try to rob you, giving you another opportunity to run. Running is good for circulation, and circulation is the key to DF. Once you begin to exercise on a consistent basis, your body will reach a state known as the runner's high. This happens even if your exercise isn’t running. The great thing about runner's high is that it’s another addiction. And it's legal. This confirms the inherent logic of DF -- drugs and health are both addictive. Breathing is also important, or as dopers prefer to call it, inhaling. Finally, moderation is the key. Always do everything in moderation unless it feels so good you don't want to stop. This is okay. Listen to your body, which has natural mechanisms designed to tell you when to stop. It will say, “You have reached a state of stupor, and it's time to pass out.” And you do. It’s as simple as that. Remember, it took years to get into the miserable shape you're in, and it's gonna take a while before your Flabio is transformed into Fabio. Be patient. It’s worth it. DF is the wave of the future, and the surf's up. Grammy Award winning comedian Tommy Chong is legendary for his invaluable contribution to American counter-culture as part of the iconic comedy duo Cheech & Chong. During their reign, the twosome recorded six gold comedy albums, including the 1973 Grammy winner "Los Cochinos," and starred in eight films, most of which Chong co-wrote and directed. The first, Up In Smoke, was the highest grossing comedy of 1978, topping $100 million at the box office. Others were Cheech and Chong's Next Movie (1980), Nice Dreams (1981), Things Are Tough All Over (1982), Cheech and Chong: Still Smoking (1983), and The Corsican Brothers (1984). Born in Edmonton, Alberta, Canada, Tommy began his entertainment career as a musician in a Canadian-based rhythm and blues band. Eventually, he landed a gig with the "Vancouvers"" and co-wrote the band's 1960's hit, "Does Your Mama Know About Me."" From here, Chong eventually turned towards the life as an actor. The first step was forming "City Works," an improvisational group where he consequently met his future comedic partner, Richard "Cheech" Marin. Throughout the 1970's Cheech & Chong earned a massive following until eventually, the duo had run its lengthy and prosperous course and they both embarked on solo careers. Tommy has appeared in several films including 1990's "Far Out, Man!"" and "National Lampoon's Senior Trip" (1995). Chong has also starred, most notably, as "Leo" on Fox's "That 70's Show," and has guest starred on ABC's "Dharma & Greg" and "The George Lopez Show." Chong recently released his new book entitled Cheech and Chong: The Unauthorized Autobiography about the exploits of the infamous duo's smoke-filled world. This book serves as a follow-up to his New York Times Best-Seller The I Chong: Meditations from the Joint which chronicles Chong's arrest for shipping bongs across the country as well as his days in jail and the humorous encounters of his 9 month prison stint. Earlier this year, the highly anticipated, award winning documentary A/K/A Tommy Chong was released worldwide. The documentary features the journey that Chong took after a fully armed SWAT team raided the comedian's home in February of 2003. 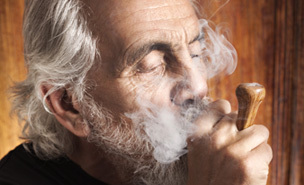 Tommy Chong was sentenced to 9 months in federal prison for conspiracy to manufacture and distribute drug paraphernalia through "Chong Glass," a family business specializing in handmade glass water pipes, or "bongs." Making history this year, Tommy Chong reunited with his old comedy partner, Richard "Cheech" Marin to announce their first tour in over 25 years with Shelby Chong opening the show. The "Cheech & Chong: Light Up America & Canada" tour has proven to be one of the most successful comedy tours of the year, selling out multiple shows from coast to coast.